One of the world's largest ever strikes began at midnight on Monday 27th Feb and will end at midnight tonight. Up to 100,000,000 Indian workers from different sectors and industries are calling for a national minimum wage, permanent jobs, and much more. The different unions have a variety of different demands, they include gaining the same rights and protection for temporary and contract workers that permanent workers have, raising and extending the minimum wage, resisting the attacks on trade unions, stopping price rises, the creation of a national social security fund, increase in pensions, and combating corruption. The workers are demanding a national minimum wage, permanent jobs for contract labourers, social security for informal labourers, pensions for all workers, intervention by the government to stop the rising costs of living, and to end the sell off of publicly owned companies amongst other demands. Transport, postal services and banking have all been hit by the strike which involves around a dozen unions, with a 'complete shutdown' of banking in Mumbai being reported. Police have been deployed to try to prevent 'unlawful' picketing, with 100 arrests made this morning for obstructing traffic. Who will meet those demands? The workers themselves, of course, when they seize what they have struck, then form Workers' Councils to restart the economy, putting the 1% out of work. Unless and until that happens, it will be "business as usual." New poster mate, sounds like they're from Occupy. I agree that a really simplistic way of looking at things, but we're far better off engaging with that person. Eleven all India trade union federations and about 5000 trade unions came together to call an industrial strike on 28 February 2012. It was reworked to become a general strike. This was against repeated court orders, according to which calling bandhs or hartals, i.e., total shut downs, which are of course political acts directed against the government over the heads of individual bosses, are not to be tolerated. In a number of provinces, governments reacted sharply. In Kerala, the Congress led government declared that those who struck work would have their pay docked. In West Bengal, the Trinamul Congress government threatened break in service and compelled a high proportion of government employees to work, often by staying overnight, though even then some 35 per cent were absent. But the strike, taken as a whole, was quite a success. Workers in sectors like coal, power generation and construction showed their solidarity with the call given by the trade unions. “We got great support from coal miners, electricity generation and transport sector,” said G Sanjeev Reddy, president of the Indian National Trade Union Congress. Among the demands was one for equal wages for equal work for regular and contract workers. Publicly, governments put on a brave face and declared the strike a failure. But reality bit hard. The Associated Chambers of Commerce and Industry of India (Assocham) said there was no justification for the strike which could have resulted in a national economic loss of about Rs 100 crore (US $ 20 million). Among the unions’ demands are a national minimum wage, permanent jobs for 50 million contract labourers, more government efforts to rein in the rising cost of living, and an end to the sale of stakes in profitable public companies. In Kolkata, a traditional trade union stronghold, most bank branches, shops and other businesses were closed, with taxis and rickshaws staying off the streets. The city’s metro (citywide underground railway service) was working normally, and West Bengal’s aggrressive Chief Minister Mamata Banerjee, who had denounced the strike call, brought 1,000 state-owned buses into the city. Kolkata police chief R.K. Pachnanda said 10,000 police officers had been deployed across the city, including special units in government offices, bus depots and metro stations to prevent intimidatory picketing by union activists. The Press Trust of India (PTI) news agency said about 100 pro-strike supporters had been arrested in different districts for obstructing rail and road traffic. In Mumbai, the financial capital of India, All India Bank Employees Association general secretary Vishwas Utagi claimed there was a “complete shutdown” in the banking sector. The clearing house for transactions at the central bank had been shut, “so the private and foreign banks where we do not a have a presence also get affected,” he told Press Trust of India agency. In New Delhi, traffic was lighter than usual and people arriving at the capital’s main railway station struggled to find transport to other areas of the city. Just a couple of staff had reported for work at a branch of the Bank of India, a public bank, in the centre of the capital which was open, but no business was being carried out. Commuters complained that frequency of state-run buses was low. The one-day strike affected life across Karnataka, including Bangalore, with shops, banks, factories, restaurants and cinemas shut and public transport curtailed as taxis and autorickshaws kept off roads. More than 10,000 employees representing various unions, including those affiliated to All India Trade Union Congress (AITUC), Centre of Indian Trade Unions (CITU) and bank employees took out protest rallies against the anti-labour policies of the UPA government, in front of Town Hall and Mysore Bank Circle in the city. In Nagpur, not only were transport services and banks hit, but for the first time in recent past, the Ordnance Factory at Ambhajhari, which makes artillery shells as well as the latest Pinaka rockets, was closed for the day. This factory makes almost 600 shells of different calibers including those of 155 mm fired through Bofors guns, apart from dispatching 24 Pinaka rockets each day. This was all held up due to strike. Industrial unions, unions organizing the unorganized, bank unions, and teachers unions all came together. The All India Federation of University and College Teachers’ Organisations endorsed the strike call. Currently, across the country, full time teachers are waiting for five years for their back wages while the number of ill-paid contract teachers is increasing. The picture is equally grim among government employees. Outsourcing, contractualisation and casualisation of the workforce, which began n 1993-94, has by now resulted in a loss of close to a million permanent jobs. As a result, pressure was so high that even the Congress controlled INTUC was forced to go along with the strike call, alog with unions led by CPI, CPI(M), socialists, and others. 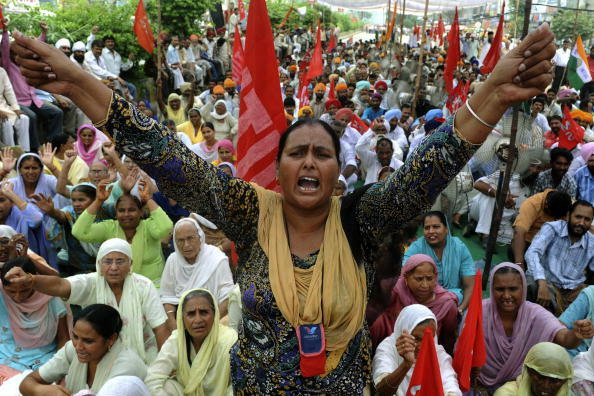 The unions said hundreds of workers were arrested from various states, with 200 arrests being reported from Delhi and 2,000 from Jammu and Kashmir. They said a similar number was arrested in West Bengal where the government was opposing the strike call. We will destroy the planet if Labor is not sovereign everywhere. I submit, plunder is groundless and only leads to further 'breaking', this is why the planet is melting. not sure what this means.. you sound a bit like a concerned pirate. Can you expand please? is there any post-strike estimate of the number of strikers?